This is one of those rare occasions in which the film completely trumps my impression of the book. If you recall the account of my reading experience I posted a little while back, you'll remember that I struggled to read Yann Martel's novel. I was determined to, though, because I wanted to make sure I was prepared when it came to watching the film adaptation of Life of Pi. However, as you'll see, it did little to prepare me. I have never seen a film so beautiful and, for once, 3D played a large part in my enthusiasm. Usually I'm not a fan of 3D, but in Life of Pi it adds a more palpable emphasis to the wonder of the film. The animals are also flawless, appearing inconceivably realistic (I had to keep reminding myself that it's not possible to train a tiger how to act so specifically!). The varying phases of the water, the sky, the vibrant colours on the streets of India... every element is represented magnificently. 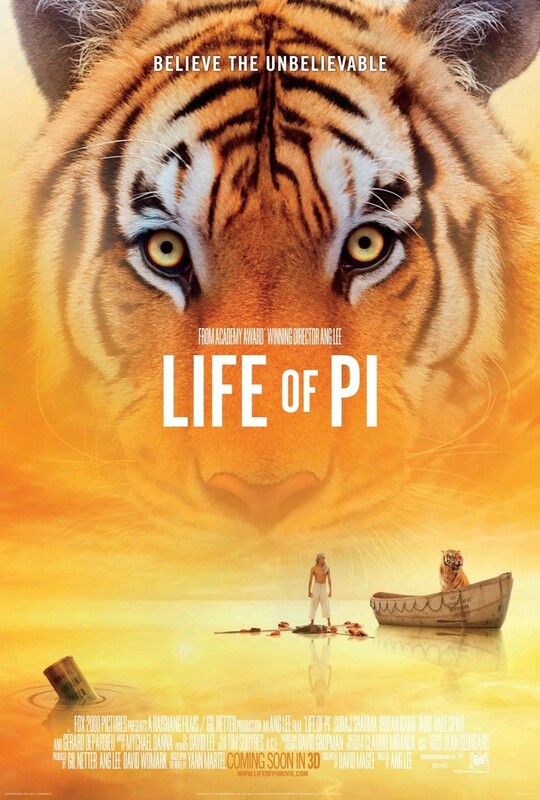 But Life of Pi goes far beyond breathtaking cinematography and astounding visual effects. Spiritual elements in the film are prevalent and extraordinarily powerful, without being preachy. They were particularly detectable to me because in my own life, I'm far from being an atheist. But, in saying that, I'm not a religious person either. Rather, I am spiritual. Similar, in ways, to Pi, I like to take pieces from different religions and create my own ideologies. I'm sure to many people this won't make a lot of sense (at times, I'm not even sure it does to me! ), but it's something that provides me with a lot of comfort. Comparatively, Pi likes to grab hold of all his chosen religions and utilise their particulars as well as he can. They are fundamental aspects of his life. So, I found the spirituality of the film very difficult to ignore; particularly as Pi is drifting across the Pacific Ocean with one bloodthirsty Bengal tiger! All components are strikingly enhanced by the soundtrack, which blossoms from the moment the film starts. Honestly, if Pi's Lullaby doesn't win the Academy Award for best for Best Original Song, I'll be pretty annoyed! It's also very hard to believe that the actor who plays Pi Patel (Suraj Sharma) is brand new to the world of acting. What a challenging role this must be: Pi is the person who carries the entire story on his shoulders. If Suraj's interpretation failed, the movie would have been a disaster. But he pulls it off with incredible strength and self-assurance, and I am very surprised he wasn't nominated for an Academy Award for his performance. I highly recommend that you listen to/watch the Meet the Filmmaker podcast with Ang Lee if you get the chance – the director provides flabbergasting insight into the ways Suraj was prepared as they were filming. Visually, audibly, spiritually, and emotionally, nothing will top Life of Pi in my eyes. I hope many others get to see this film and be as touched. Ang Lee has truly outdone himself.